A mix of Dutch speakers from different fields, all in favor of a basic income, interactively discussed the concept of a universal basic income (UBI) during the symposium “a basic income, full speed ahead! !” [“het basisinkomen, volle kracht vooruit! !”] on January 23rd . The aim was to gather ideas about how to progress to make UBI a reality in the Netherlands as soon as possible. The symposium was organized by “Basisinkomen2018”, the organization behind the petition signed by more than 66,000 citizens (a number that is still growing). Johan Luijendijk, co-founder of “Basisinkomen2018”, announced a few activities his organization will be organizing and/or funding in the Netherlands such as competitions between universities and informative movies aimed at countering negative preconceptions about a basic income. He states that supporters can be found in left as well as right wing populations, but the image of a basic income is that of a left wing idea. There is still a lack of understanding of the concept of a basic income and many still believe it will make people lazy. There is also an obstinate, Calvinistic opinion in the Netherlands that one has to work for every penny, argues Luijendijk. The audience expressed the need for a clear overview of each political party’s stance on basic income in the Netherlands. (On March 15th, the country’s Parliamentary elections will take place). “Overall, the idea of a basic income is very much alive in the Netherlands, and Basisinkomen2018 will continue to invest in explaining the concept to the people,” Luijendijk assured the audience. An explanatory animation about basic income was introduced during the meeting, including strategic instructions about how to share it (not all at once). “More and more people are working in multiple small jobs in order to earn enough money for a decent living. With a basic income, unemployment can be abolished.” Castelein continues, “a basic income would contribute to a redistribution of work and income with less working hours a week, creating possibilities for participation in caring roles or other (currently unpaid, but useful) work.” People from the audience complemented these expected results with positive effects on health, decreasing criminality, and more room for creativity and contribution to solutions for the problems in society. Employees can better focus on their work if they are not distracted by the struggle to make a living and the quality of work will improve under such circumstances, argues Ton Stuy, an employer in the transportation sector. “With a basic income you can take away discontent and it is an answer to Brexit and Trump’s protectionism. Furthermore, a basic income creates room for lowering wages and it will not cost more than the crazy things we spend money on now, “ he states. 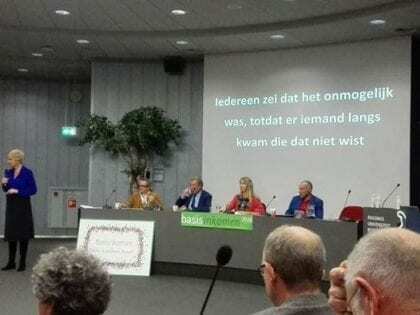 Liesbeth van Tongeren, a politician from the Green Left party (“GroenLinks”), compares the discussions about basic income with the discussions about the abolishment of slavery and the discussions about women’s empowerment in the past. In both cases, people originally argued it would be unaffordable and an unachievable goal. Eventually both turned out to be achievable and affordable. The concept of a basic income also touches the question of what is appreciated: effort or the economic benefits? Many people say, “My job is a useless job, nothing would change if I didn’t do my job.” In reaction to the remark of Ton Stuy, who thinks a basic income will have a decreasing effect on wages, van Tongeren argues that the effect will be in both ways: some jobs will be paid more and others less. It will change the established hierarchy in society and it will also change the interrelationship of many men and women. These effects cause anxiety, according to van Tongeren. For van Tongeren, the reality is that more and more people are falling out of the system. At the same time, 90 billion euros a month are created and spent in Europe in the context of quantitative easing. This money could instead be divided amongst the European citizens, which would be a good start. It would help if the IMF would make a statement about it in this context, van Tongeren states. George van Houts, from the theater group The Seducers (“De Verleiders”), shares his experience with the audience and explains the role theater can play in the discussion about the current financial system. His theater group played several pieces around this topic and attracted full theatres. “We are informed by a group of scientists (Our Money, “Ons Geld”), who check if the information is accurate.” Van Houts explains that money is made by commercial banks, as debt. “We performed a play around this topic at the Dutch central bank (“De Nederlandsche Bank, DNB”), and we were not argued against, but Klaas Knot (President of the DNB) asked why we would worry the people. ”Many top bankers know something will have to change, as the system is about to burst, according to van Houts. The responsibility of the creation of money should be given back to the government and it should not be created as debt, which is the case now. Van Houts indicates a parallel system is already in place: the DNB-coin (similar to the bitcoin). This system can function parallel to the euro and people could be given a bank account at the DNB, which could be used for a basic income, for example. This could then be managed by a public organization that is not dependent on ‘voters’ favour’. A basic income is inevitable, according to Jan Rotmans, Professor in Sustainability Transitions at Drift (Erasmus University Rotterdam). He supports this prediction by comparing the current stage of the “digital revolution” with the industrial revolution of the 19th century. “We live in a time of chaos, anxiety and social inequality, but eventually, the optimists were right.” The most important resistance comes from within, Rotmans explains. “It is better to have one small success story than many meetings trying to think it all through in order to implement it on a large scale. Just start doing it. Examples of such small scale initiatives in The Netherlands are the crowd funded basic income project in Groningen and the initiative in Terneuzen.” (The city council of Terneuzen thought they had found a way to implement a basic income for a small group of citizens on social benefits, but a few days after the symposium the central government claimed it was illegal). The technological developments are causing a battlefield in the middle part of the working-class and this is likely to cause a downward spiral of fear that “it will happen to me”. “Can we keep everyone at work? No,” so radical solutions are necessary, according to Rotmans, one of which can be a basic income.